Mahlambi has collected a number of man-of-the-match awards since making his professional debut in Wits’ 2-1 league win over Ajax Cape Town earlier this season, which has seen him being called up to the national Under-23 team for the upcoming U-23 African Nations Cup in Senegal. The 18-year-old has so far bagged two goals and three assists in his five league and cup appearances this season, and says Hunt has been key to instilling belief in him. “I can say my motivation is my coach because he is always telling me to do what I want with the ball,” says the soft-spoken Mahlambi. The midfielder scored and set up teammate Sibusiso Vilakazi to ensure a 3-1 victory over Jomo Cosmos in their previous league encounter, and fully believes in Hunt’s decision to convert him into a striker. “Yes, I’m comfortable [with the coach converting me into a striker], because the coach is the one who makes the decisions and I just play for the sake of playing football. “The coach is the one who tells me what to do, and I guess he’s right because it’s already bearing fruit,” he adds. Mahlambi says he has no problem playing alongside vastly experienced campaigners such as Elias Pelembe, Vilakazi and Daine Klate, and reveals that he has been learning a lot from them. “It’s a lot easier for me [to play with them] now, because at training I am able to chill with them, where they tell me what to do and also help me with extra training. Wits next face Golden Arrows in an Absa Premiership clash at the Bidvest Stadium on Saturday afternoon, with kick-off set for 15h30. 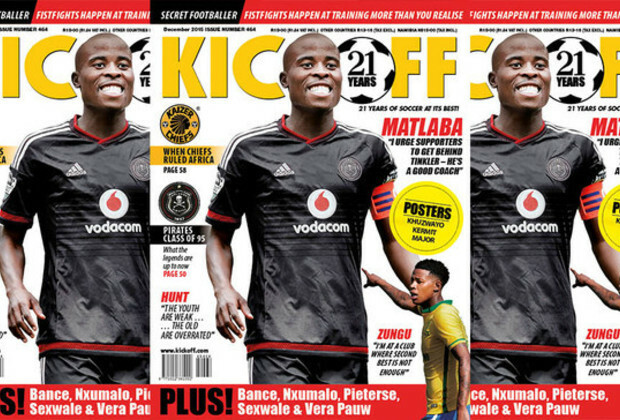 In the new KICK OFF magazine, December Issue 464 – on sale today – Wits coach Gavin Hunt likens Mahlambi to Bafana Bafana legend Benni McCarthy. Download a digital copy now!